SIZE 3.3 X 4.5 METER. 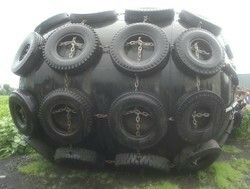 Our company has gained name and fame in presenting Pneumatic Fender. IRM’s range of hydro-pneumatic fenders are designed to be installed vertically making them ideal for use with submarines or vessels whose impact point is likely to be below the waterline such as catamarans, semi-submersible platforms and drilling rigs. The fenders are manufactured with a water tight bladder inside that has external access points for ballasting and trimming. Manufactured as per ISO 17357 with 0.5 kg/cm² and 0.8 kg/cm² internal pressure, these Fenders are extensively used for ship to ship transfers at mid sea, as well as vessel to berth at dock/jetty.